Ifrah Mansour is a Somali, refugee, Muslim, multimedia artist residing in Minnesota. She explores trauma through the eyes of children to uncover resiliency. She interweaves poetry, puppetry, films, and installations to illuminate the invisible stories of immigrants. Her critically-acclimated “How to Have Fun in a Civil War” premiered at Guthrie Theatre. Her first national museum piece; “Can I touch it” as part of “I am Somali” exhibit at Minneapolis Institute of Arts. Kate McDonald shot, directed, edited and produced this film. Her work has appeared on PBS NewsHour, Entertainment Weekly,and National Public Radio. At Twin Cities PBS, she works for the award-winning show “MN Original” and is the series producer for the multimedia series “Art Is...” She recently produced the feature length film, “The Seeker," starring Josh Radnor ("How I Met Your Mother"). She is the recipient of 6 regional Emmy Awards. Read the full Q&APBS spoke with Author Ifrah Mansour and Filmmaker Kate McDonald about the shared experiences, hope and positive change from refugees across the nation. 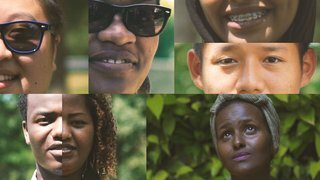 PBS: Ifrah, can you tell us more about the history and origin story of your poem “I am a Refugee”? How did the concept of written word to film come to fruition? Ifrah Mansour: When the Trump administration introduced the first Muslim travel ban, I got a lot of performance requests to share my reactions. I honestly didn’t know how to speak to something as so immediately felt by people around me, as my relatives’ arrivals to America got delayed and some of my student family’s reunion plans got changed forever. It seemed too easy to give in to despair. We live in a time where the seeds of hateful oppressions are being planted. But it's also a critical time to stand for our ideals and our values.